You might expect universities to be enlightened employers and to respect freedom of speech, but while that might once have been so, nowadays you – like me – would be disappointed. 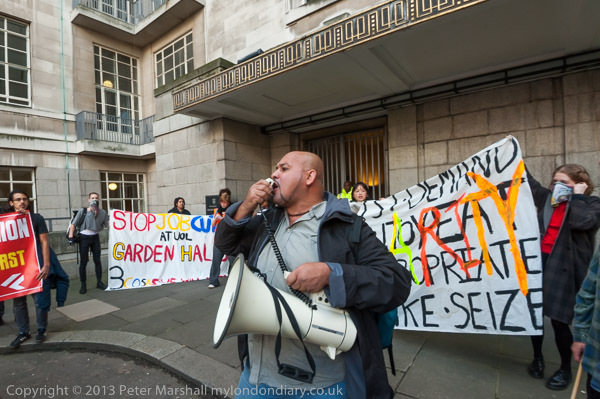 When workers at London University staged a number of in noisy protests last academic year for a living wage and proper conditions of service, the response of the university management was not to support them but to ban further protests and threaten to call in the police. The ‘3 Cosas‘ campaign for proper pay and conditions for low paid staff at the university has widespread support from students and academic and other staff employed by the university. Earlier campaigns by the low paid workers have resulted in some of them now getting a living wage, but even for these the conditions of employment – things like sick pay, holidays and pensions – are far less favourable than they would be if the university employed them directly, rather than buying them in as cheap labour from contractors. Its a curious position to work at the university but to be employed by another organisation, as their work is vital to the running of the institution. Even if the university engages another company to manage the cleaners, security and catering staff etc, they are still a part of the institution and it surely has a duty towards them to ensure they get proper pay and conditions. 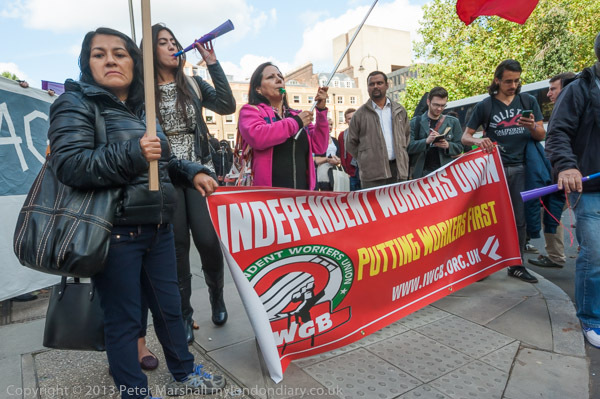 Many other organisations have realised this and made paying the living wage and proper conditions a requirement on companies contracting to run services for them. But rather than standing up for those who work there, London University has said it is none of their business and objected to protests warning members of the university they may face arrest if they protest on campus. The protest by the ‘3 Cosas’ movement on 24 Oct was in direct defiance of this ban, and resulted in far more disruption than any previous protest – and greater cost to the University. Extra security staff were on duty, with gates around the Senate House locked and checks made on all those entering. At first this kept the protesters out, but a few students and academic staff made their way inside the closed area and started to protest, resisting arguments by security and managers to leave. Eventually the bulk of the protesters decided to walk around some of the barriers and make their way to the Senate House, and I followed them. Some had actually climbed the tall fence or gates in front of Senate House, but I was considerably less athletic, simply walking through a gap in a very threadbare hedge and across a lawn. 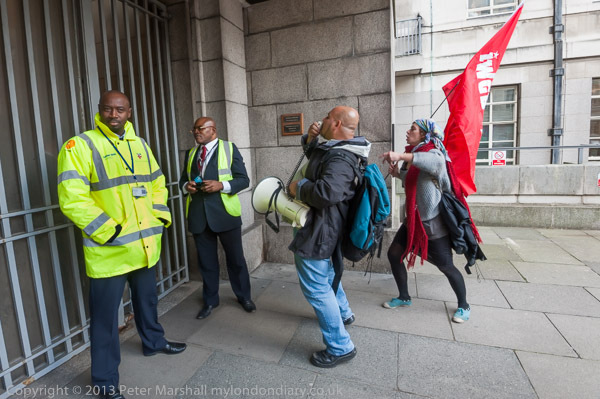 Having defied the ban on one side of Senate House I was a little surprised when it turned out to be equally easy for the protesters to walk round to the other side and do so again. But if the authorities really intend to stop protests they will need to invest heavily in barbed wire! By this time the university management had called in the police, though I don’t think the police were all that pleased or sure what their role should be. 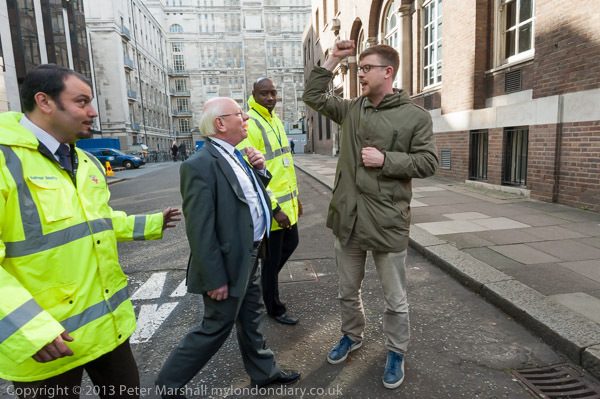 It was after all a peaceful protest and causing little or no disruption – and what disruption there was mainly from the action of the university security. Finally as the protest was almost at its natural end, the police decided to act, moving in and trying to stop the protest ending! 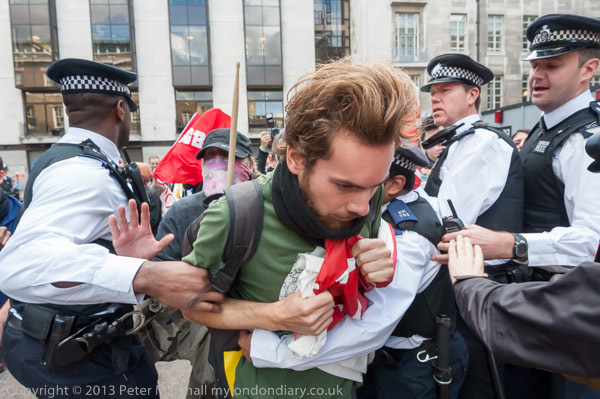 The result was something of a farce, with a handful of police grabbing the odd student while the others simply walked past – as I did. After a little argy-bargy and some actual barging the police came to their senses and walked away, leaving the protesters to rightly claim a victory. They had stood up to the university authorities and to the police in a protest not just about the ‘3 Cosas’ but about freedom to protest and freedom of speech. It may not end there. While the protesters were inside around the Senate House, there was a man on a balcony filming them – to which the protesters took exception. It seemed an unnecessary provocation, and suggests that the authorities might be considering disciplinary or legal action against those taking part. This would be an extremely inflammatory act, and one that would reflect badly on the university. 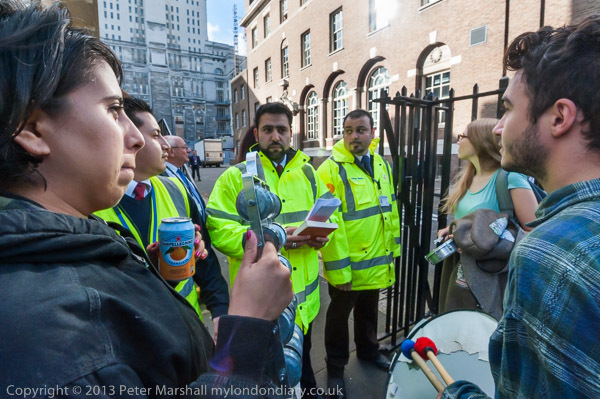 More at 3 Cosas Defy London Uni Protest Ban. This entry was posted on Friday, November 29th, 2013 at 09:07 am and is filed under My Own Work, Photo Issues, Political Issues. You can follow any responses to this entry through the RSS 2.0 feed. You can leave a response, or trackback from your own site.